The return of the Great Britain jersey has been confirmed for a Lions tour this autumn. The recent meeting of the Rugby League International Federation confirmed a four-match tour of New Zealand and Papua New Guinea. It will be the first time Great Britain have played since the home series against New Zealand in the autumn of 2007, and their first appearance in the southern hemisphere since the 2006 Tri-Series – reviving a tradition which dates back to 1910, when the first touring team after the 1895 Northern Union breakaway were known as the Lions. In addition to two Tests against the Kiwis and one against the Kumuls – the latter a first in Papua New Guinea since 1996 – Great Britain will play their first ever Test against the Tonga team who made such an impact in the 2017 Rugby League World Cup, including in a stirring semi final against England in Auckland. Venues and dates will be confirmed overnight in Auckland. Wayne Bennett, who has been the England coach since 2016, will be the head coach of the 2019 Rugby League Lions, with further details of his support staff, the composition of the squad and the selection process, the kit design, and kick-off times and travel packages for the tour to follow in coming weeks. “It’s an honour to be involved in the revival of the Great Britain team as head coach,” said Bennett. “I’ve coached against them in the past with Australia, and wherever you’re from in the world of Rugby League, that Great Britain jersey is a famous one – and I’m sure the current generation of players will be excited by the prospect of wearing it and representing their country in New Zealand and Papua New Guinea." 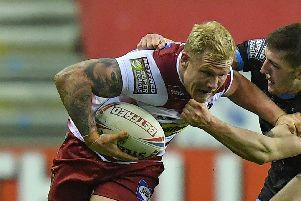 Wigan's England players such as George Williams, Oliver Gildart, Joe Greenwood and captain Sean O'Loughlin will be eyeing places on the plane, as well as Welsh prop Ben Flower. Wigan Warriors prop Gabe Hamlin charged with "UK Anti-Doping violation"